SharePoint RichText Boost dramatically enhances the functionality of the default SharePoint rich text editor without creating a new column type. It adds the ability to upload and insert images, hyperlinks, and flash movies directly into any rich text column without first storing them in a document library, making it ideal for storing complex and formatted content in any SharePoint list. Moreover. ...... the original dimensions of the image. Increase/decrease size of RichText area without posting back. By default, users can't adjust the size of RichText area when editing item; it is not convenient when users want to input large text or insert large images or tables etc. 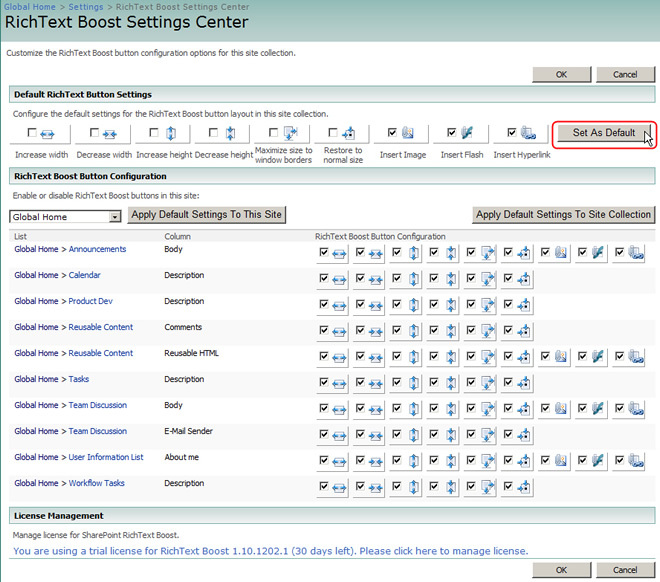 With RichText Boost toolbar, users can freely increase/decrease height/width of the RichText area. These operations are completed on the client side without posting back to server. Qweas is providing links to SharePoint RichText Boost 1.14.511.1 as a courtesy, and makes no representations regarding SharePoint RichText Boost or any other applications or any information related thereto. Any questions, complaints or claims regarding this application SharePoint RichText Boost 1.14.511.1 must be directed to the appropriate software vendor. You may click the publisher link of SharePoint RichText Boost on the top of this page to get more details about the vendor.